During my first two years of college I worked for the YMCA as a before and after school childcare worker. I was assigned to be Geraldine Zollner’s assistant at Washington School. At the time Washington School was a kindergarten center. I dreamed of being a kindergarten teacher when I grew up so it was the perfect placement. Little did I know what a positive impact Gerry Zollner would have on my life. Through her youngest daughter I was recently reminded how much Gerry enjoyed working with me. I began working with Gerry the same month her youngest child left for college. Although I could never replace Kristie, for two years I was a surrogate daughter helping Gerry acclimate to having an empty nest after successfully raising seven children. We saw each other every weekday morning at 7 am sharp and again each afternoon from the time the school bell rang until the last parent picked up their little one at 6 pm. Gerry was there for me as I navigated my first years of college and supported me as I juggled my studies with a part time job. Although she never knew it I often referred to Gerry as “Grandma Gerry.” It was the perfect name because she was a mother to seven children, a grandmother to fourteen and a great grandmother to two. And over the years she was a grandma to all of the children under her care at Washington School. She banadaged their scraped knees, gave reassuring hugs and comforted little ones who missed their mommies. I remember the words of motivation she shared with me before I headed off to take an exam or give an important presentation. Grandma Gerry was filled with smiles most of the time but she did have “the look.” And everyone knew when she gave you “the look” you needed to shape up or you were going to be in trouble. Grandma Gerry always had a stash of saltine and graham crackers that she handed out to ease tummy aches and tears. Our “latchkey kiddos” occasionally felt anxious when their parents were late picking them up but with love and compassion and a few crackers, Grandma Gerry successfully turned frowns into smiles. I was a happy recipient of her crackers and caring on several occasions. I will never forget the extra time and effort Gerry put into her job, especially during the Christmas season. 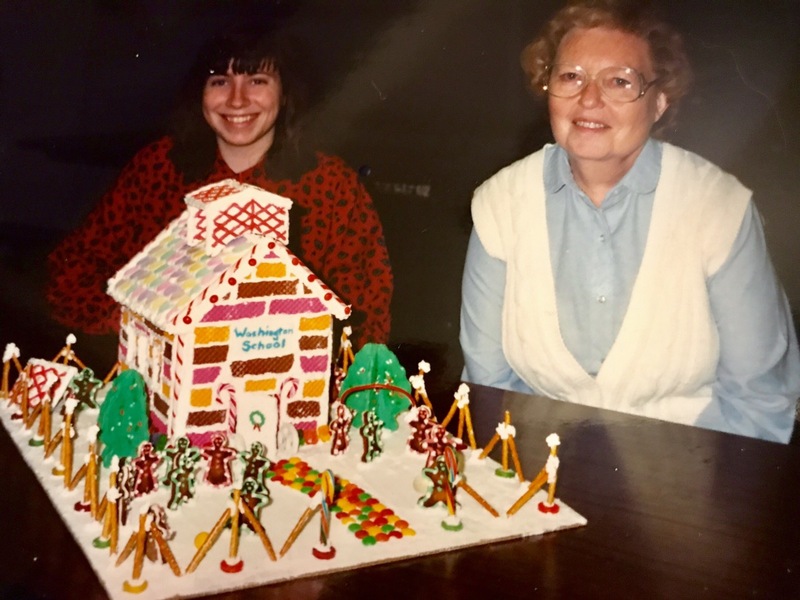 The first year we worked together she helped the kids make a gingerbread schoolhouse that she entered in Belleville’s famed gingerbread contest. After weeks of constructing and decorating our masterpiece, we were thrilled to win a ribbon! At the time the YMCA sponsored an annual YMCA Latchkey Christmas Program where the children and their caregivers prepared songs to sing on stage. The first year I helped the kids learn the song “We Are Santa’s Elves” and the second year we performed “Suzy Snowflake.” Gerry went the extra mile and supervised the construction of sets and costumes for both performances, spending hours outside of work to make sure everything was perfect. Sometimes people come into your life for a short time leaving you with lessons that will stay with you for a lifetime. Grandma Gerry taught me that it’s the little things that we do for each other that really make an impact. That extra hug, a reassuring smile or a package of saltine crackers shows others that someone cares. Although Gerry and I hadn’t seen each other for close to twenty years we continued to exchange Christmas cards and recently found each other on Facebook. I wish this story ended with a happy “face to face” reunion as Grandma Gerry expressed interest in meeting my little Lillian Clare. Sadly, Grandma Gerry passed on last week and the reunion never happened. I find comfort knowing there is another beautiful angel in heaven watching over all of us and I will never forget Grandma Gerry and her devotion to her job, her love of children and her special stash of saltine crackers. The Snowman… 40 Years of Snow Much Fun! Happy New Year… Hands On Fun in 2019!